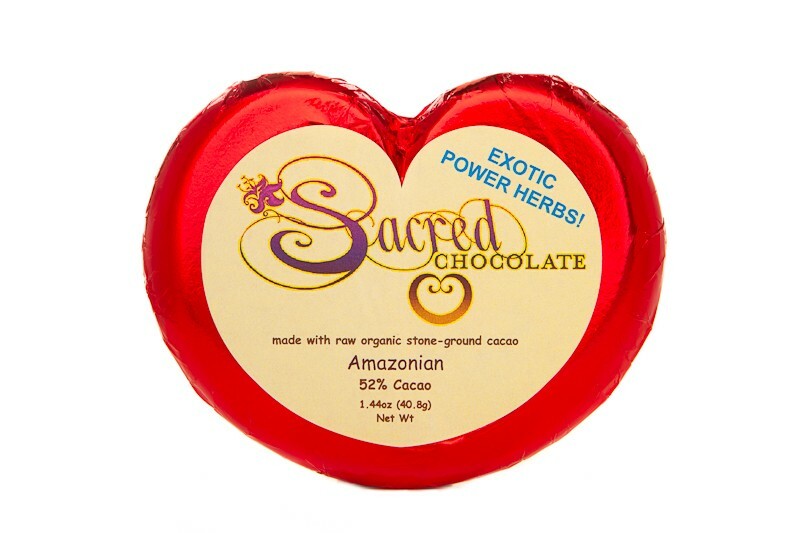 Sacred Chocolate's Amazonian is a cult classic. 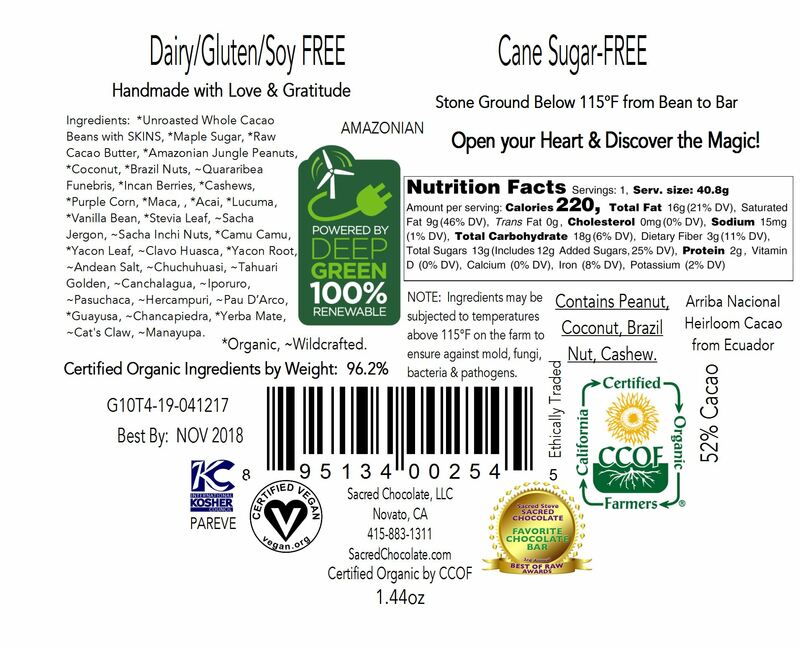 With approximately 22 powerful Amazonian herbs plus nuts and berries from the heart of the Amazon jungle, this bar is truly a 5 minute flavor expedition through the Amazonian--just be sure to take small bites and let it melt in your mouth! The Amazonian has a 52% Cacao Content. This is a medicinal, therapeutic chocolate with very bitter notes and many fruity and nutty tones as well. The Amazonian includes the whole cacao bean with the skin/husk still attached for superior nutrition. The Amazonian is slowly stone-ground from bean to bar right in our custom chocolate factory in Marin County, California, which was designed from the ground up to make raw chocolate! Each 1.44oz bar comes in the shape of a perfect golden spiral heart, symbolic of the fact that raw cacao is so good for the heart. This delicious Sacred Chocolate heart bar is hand poured & hand wrapped. All Sacred Chocolate is prayed over by Sacred Steve, the Sacred Chocolate Oompa Loompas and others! Certified Organic Ingredients by Weight: 96%. Produced in a Facility that also Processes Nuts. This is a definite treat to the senses. Feelings of well being and bliss, enrobe your body as the delicate flavors of this smooth treat awaken body and mind. After trying this you will experience the best chocolate day ever! Wow - this one has to be tasted to appreciate it!